With Danish roots and operations in Berlin, Foul-Up label has been around for a few years and most recently brought to us notable electro oeuvres from Galaxian and Beastie Respond. For the fifth release, the label founder Nicolai Vesterkær Krog unites his Misantrop moniker with Lasse Bjørck Volkmann’s Metalized Man, for a new project called Glass Knot. Available in cassette and digital, Glass Knot’s debut album offers seven interpretations about “Present Tense”. Although the duo is tackling the theme from experimental angle, part of Glass Knot’s inspiration is obviously dwelling in Berlin’s Abfahrt-hedonism, even when the album has chosen an uneasy way to address the floor nation. There are some club hopefuls in the album, like the opener “Present Tense 1” that rises from modular growl and mutilated electro bits, to get a decisive push from a wealth of layers. The track “5” is similarly drawn by sluggish rhythm and ghetto drums, while crunchy and drilling “7” may appeal to heady floor sections. Speaking of darker side, in “2” disturbing flow of drones is filling the space with odd noise, scratching the surface of musique concrète. “6”, offbeat exercise with shuffled ambient textures, stages a mess in an empty cathedral, in awkward harmony with ravaging thunderstorm outside. A touch of eighties is added to two-minute dash “3”, MCd by Max Headroom soundalike with broken accent and the groove mimicking Richard H. Kirk and Paul Hardcastle, while after an abstract start, “4” turns into a melting pot of raw techno and breaks. 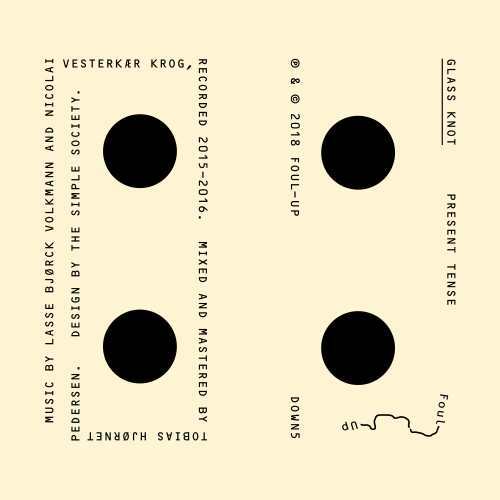 Glass Knot’s compositions are a brave attempt to challenge digestive powers of techno floor, in this respect reminding of sound experiments of Peder Mannerfelt, both the artist and the label.